Although you are gone, you will always have a piece of my heart. She was my first cat. I was 6 when I got her. She was my baby. She followed me everywhere. We slept together. She was a calico. She didn't like other animals, but that never bothered me, because she loved me more than anything. I was devastated when she passed. Forever and always she will have a piece of my heart. R.i.p Belle Marie Lares. I couldn't have asked for a better first cat. Thank you all for your beautiful comments. I still miss her to this day, even though I have my new furbaby Sapphire. Reading these made me so happy...She was my best friend. I'll miss her dearly. The best thing for my loss was a small memorial tattoo. What a lovely tribute to a first cat. So sorry for the loss of your Belle. Every pet holds a special place in our hearts furever, but the first one is truly special. 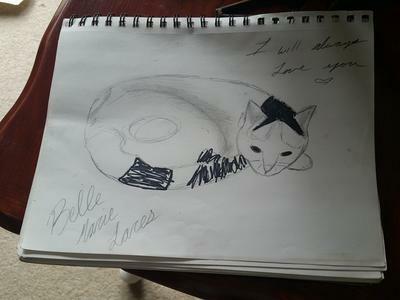 Looking at your beautiful drawing of Belle you can see the love you shared. I think Belle has not gone with a piece of your heart as much as it seems she lives there. I know your heart is broken, and nothing I say will help. I have lost beloved companions, so I know how it feels. my prayers are with you.